“The best day of your life is the one on which you decide your life is your own. No one to lean on, rely on, blame. and you alone are responsible for the quality of it. What is the Difference Between Simple Living & Voluntary Simplicity? What is the flower in the photograph please? It is lovely. 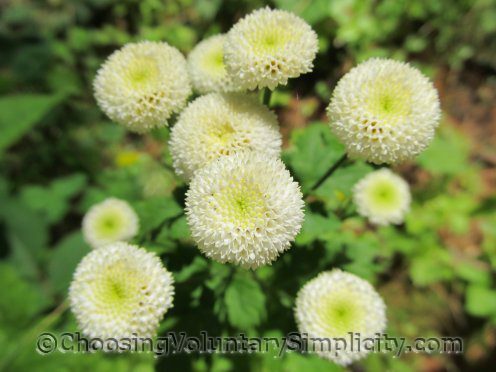 Waltraud, it is just a simple feverfew. I have these ball type feverfews in yellow and white. This is a great quote but it is not easy to do what the quote says. I need to have an honest look at the way I live my life and the person I am. I pray that I will have the courage to do that. Your site inspires me daily. I wish I knew people like you in real life.